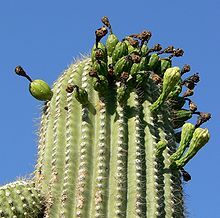 Caryophyllales (/ˌkærioʊfɪˈleɪliːz/ KARR-ee-oh-fil-AY-leez) is an order of flowering plants that includes the cacti, carnations, amaranths, ice plants, beets, and many carnivorous plants. Many members are succulent, having fleshy stems or leaves. The members of Caryophyllales include about 6% of eudicot species. This order is part of the core eudicots. Currently, the Caryophyllales contains 33 families, 692 genera and 11,155 species. The monophyly of the Caryophyllales has been supported by DNA sequences, cytochrome c sequence data and heritable characters such as anther wall development and vessel-elements with simple perforations. Although the monophyly of the order has been strongly supported, their placement is still uncertain. Systematists are undecided on whether Caryophyllales should be placed within the rosid complex or sister to the asterid clade. The possible connection between sympetalous angiosperms and Caryophyllales was presaged by Bessey, Hutchinson, and others; as Lawrence relates: "The evidence is reasonably conclusive that the Primulaceae and the Caryophyllaceae have fundamentally the same type of gynecia, and as concluded by Douglas (1936)(and essentially Dickson, 1936) '...the vascular pattern and the presence of locules at the base of the ovary point to the fact that the present much reduced flower of the Primulaceae has descended from an ancestor which was characterized by a plurilocular ovary and axial placentation. This primitive flower might well be found in centrospermal stock as Wernham, Bessy, and Hutchinson have suggested.' "
Cactaceae native to the middle region of South America, at Marsh Botanical Garden. Cactaceae are a plant family, under the order Caryophyllales. As circumscribed by the APG III system (2009), this order includes the same families as the APG II system (see below) plus the new families, Limeaceae, Lophiocarpaceae, Montiaceae, Talinaceae, and Anacampserotaceae. ^ a b c d e f g Angiosperm Phylogeny Group (2009). "An update of the Angiosperm Phylogeny Group classification for the orders and families of flowering plants: APG III". Botanical Journal of the Linnean Society. 161 (2): 105–121. doi:10.1111/j.1095-8339.2009.00996.x. Archived from the original (PDF) on 2017-05-25. Retrieved 2013-07-06. ^ Clarke, Ian; Lee, Helen (2003). Name that Flower: The Identification of Flowering Plants. Melbourne University Publishing. p. 56. ISBN 978-0-522-85060-4. ^ "Caryophyllales". Angiosperm Phylogeny Website. ^ Judd., W.; Campbell, C.; Kellogg, E.; Stevens, P.; Donoghue, M. (2008). Plant Systematics: A Phylogenetic Approach (3rd ed.). W. H. Freeman. ISBN 978-0-87893-407-2. ^ Stephens, P.F. (2001). "Angiosperm Phylogeny Website. Version 8, June 2007". ^ a b c d Juan, R.; Pastor, J.; Alaiz, M.; Vioque, J. (1 September 2007). "Electrophoretic characterization of Amaranthus L. seed proteins and its systematic implications". Botanical Journal of the Linnean Society. 155 (1): 57–63. doi:10.1111/j.1095-8339.2007.00665.x. ^ Lawrence, G.H.M (1960). Taxonomy of Vascular Plants. Macmillan. p. 660. Wikimedia Commons has media related to Caryophyllales.